When last we visited with known trope vigilante and legacy scoundrel Brian Azzarello he was defiling the sacred Watchmen texts by suggesting that a right winger like the Comedian would have hung out with the Kennedys and would have needed to be lured away from the president in 1963. This is a gross violation of the sacred writings that suggested, quite correctly I would think, that the Comedian would have been more likely to have been the second gunman on the grassy knoll who got away. The correct intrepretation of the Holy Writ that was even mirrored in that so so movie adaptation that came out. So your question coming into this issue is what defiling shall Azzarello engage in now? Why haven’t people in “V for Vendetta” or “Painted Doll” masks eliminated this “problem” before the second issue came out? I have to confess that this issue seems more in line with sacred orthodoxy but just seems kind of dull and doesn’t really add much to the lore. I guess thats Alan Moore‘s argument to begin with. Yeah they’re just best buds those two. This is inconsistent with the kind of right wingers that we have in this country. The Comedian wouldn’t have been friends with Bobby Kennedy for the same reason that Republicans swift boated John Kerry: It doesn’t matter that the guy served the country if he’s wrong on the other cultural issues. It wouldn’t have even mattered if the Comedian had served with one of the Kennedys in the Pacific or had even saved the Comedian’s life. The Comedian would have deeply hated someone who was working on fairness issues. 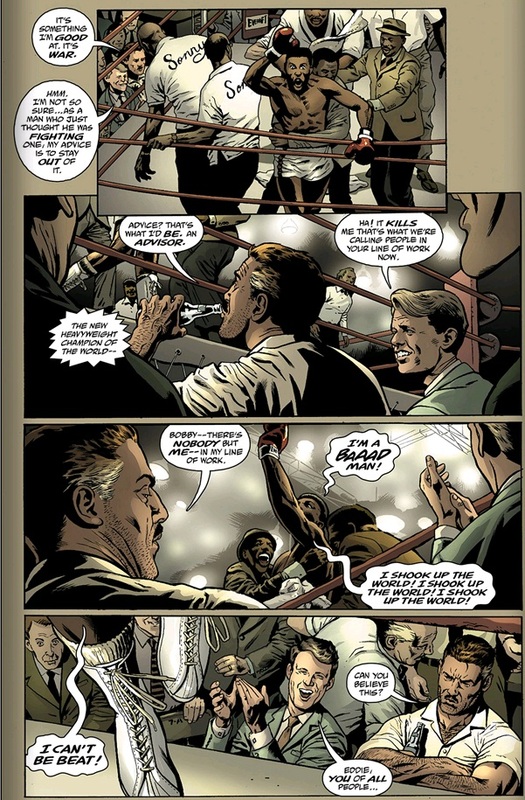 By the way, while they’re enjoying the two black guys boxing and the Comedian isn’t using the N Word because that would be politically incorrect (critic slaps his own head in disbelief…), he’s explaining to Bobby why he’s looking forward to fighting in the Vietnam War because he thinks he would be good at killing Third World people. Of course, if you had been distracted and let John Kennedy get shot you would think that the Comedian would never leave Bobby Kennedy’s side to make sure nothing bad would happen to him. But no. Someone with the Comedian’s clearance would have been privy to the Cointelpro program and its suggested that he’s even killed heads of state but he wouldn’t hang around Bobby Kennedy or tell Ozymandius or his son in law the Big Blue God to keep an eye out for Bobby. No sir. Just silly that friendship. But here’s where I think Brian gets it right in this issue. He makes the argument, fictionally, that the United States used drug profits to fund the Vietnam War and he even implicates the Comedian in the Gulf of Tonkin incident (because hey that’s fun if you’re into Dark Side history), which was largely thought to be a manufactured black op “Krystalnacht” kind of way. I have to admit that both of those storylines seem consistent with not only Moore’s vision but actual American history. You can read about the Gulf of Tonkin here and the reporting about the CIA’s involvement in the drug war here. That story was written by Gary Webb, who committed “suicide” some years later. We think. I think the speculation seems to be better but I found myself asking Why Bother? Definitely the most disappointing of the Before Watchmen books although well drawn, like all these books. 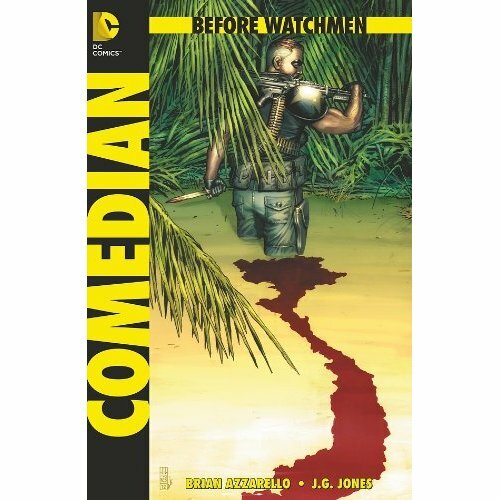 Let’s see if my hunch about the Comedian getting Dr. Manhattan involved in the Vietnam War plays out but who really cares I guess…Three out of 5 stars.